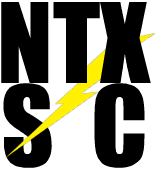 Portions of North Texas remain under a Flash Flood Watch until 7 AM Thursday June 2, 2016. The counties included in this watch are shaded in green in the image below. This includes the counties of: Bell, Bosque, Collin, Comanche, Cooke, Coryell, Dallas, Denton, Eastland, Ellis, Erath, Falls, Grayson, Hamilton, Hill, Hood, Jack, Johnson, Lampasas, McLennan, Milam, Mills, Montague, Palo Pinto, Parker, Rockwall, Somervell, Stephens, Tarrant, Wise & Young. RAINFALL IS LIKELY TO CAUSE FLOODING. 6 INCHES WILL BE POSSIBLE. Flash Flood Watch as of 12 AM June 1, 2016. 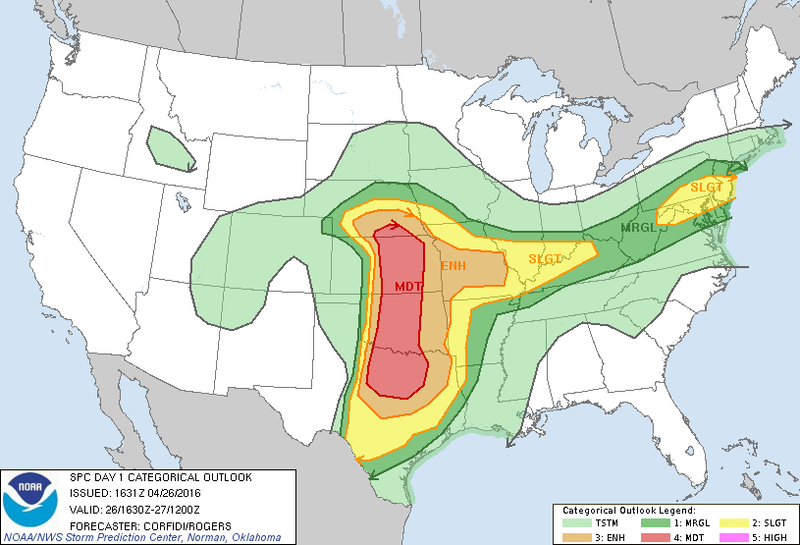 The NWS SPC has downgraded the risk from a MODERATE risk to an ENHANCED risk. 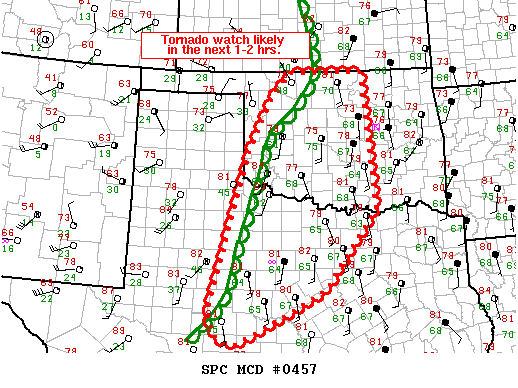 The NWS SPC says a Tornado Watch may be issued for the area outlined in Red in the next 1-2 hours. STAY TUNED FOR THE LATEST UPDATES, WATCHES AND WARNINGS. 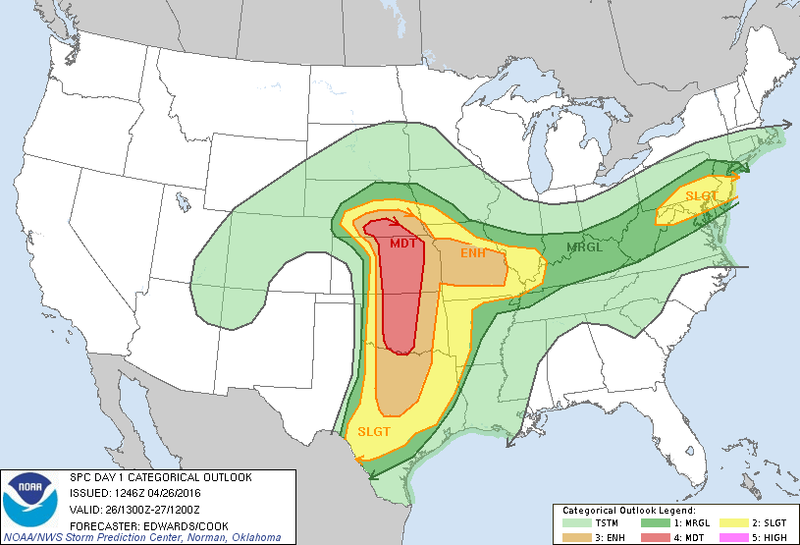 The NWS SPC has upgraded the DFW Metroplex from an ENHANCED risk to a MODERATE RISK. Good morning everyone! Here's the latest on today's severe weather threat. We're still under an ENHANCED risk here in portions of North Texas, including the DFW Metroplex. 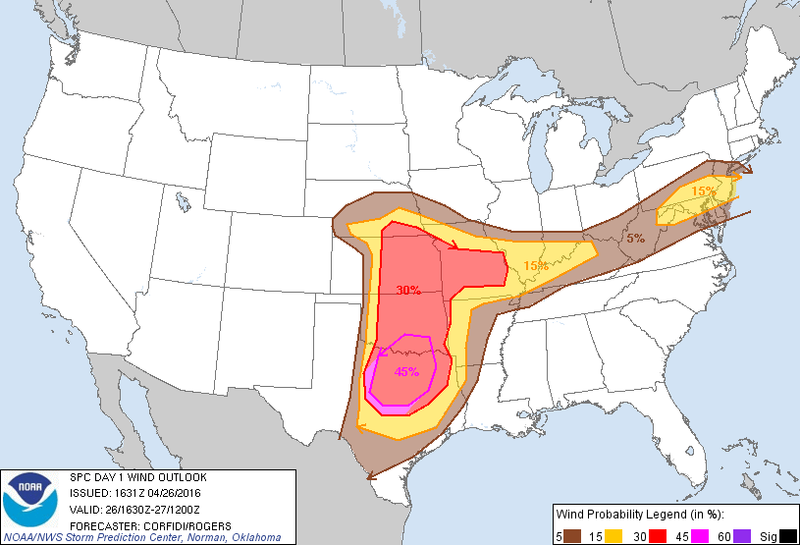 Possible threats include; tornadoes, damaging hail and damaging winds. ANY storm that forms this afternoon will be capable and likely of becoming quickly severe. 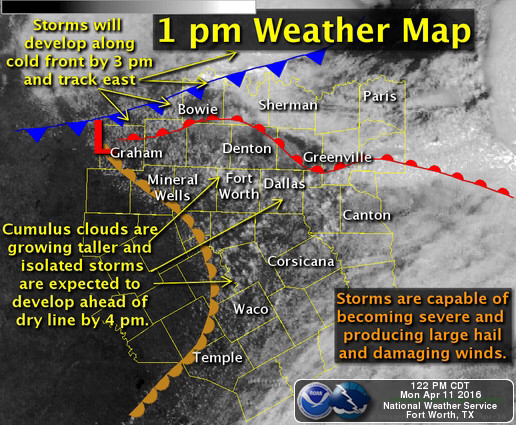 Storms should begin forming West of I-35 around 4 pm this afternoon till about 7 pm this evening. Storms should begin to make their way into DFW around 7 pm until Midnight. Do not take these timelines literally, these are only an estimate and could change. STAY TUNED FOR FURTHER UPDATEs, WATCHES AND WARNINGS. Good morning everyone! Here's the latest on tomorrow's storms. 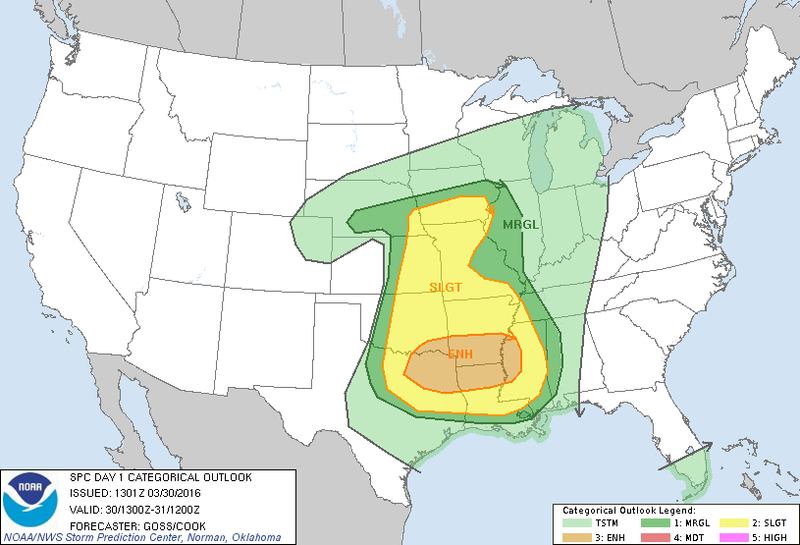 The NWS SPC had placed North Texas, including the DFW Metroplex under an ENHANCED risk for tomorrow, Tuesday April 26, 2016. 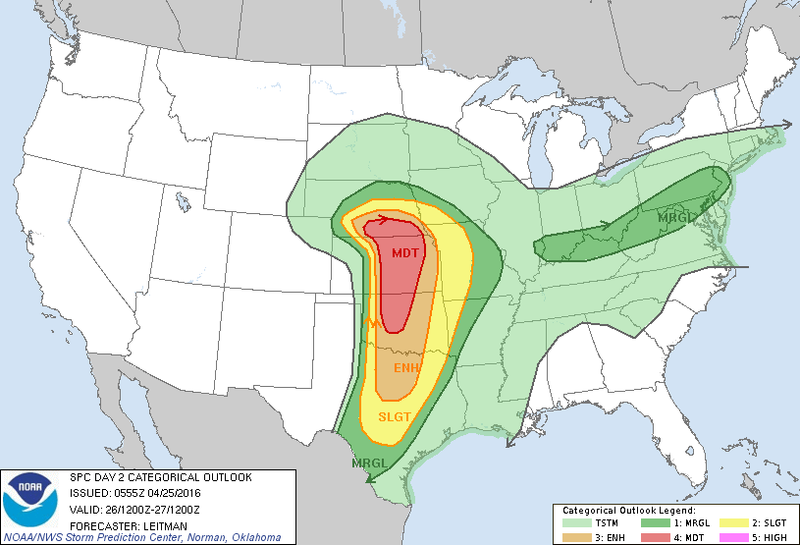 Potential threats include; tornadoes…some strong, VERY large hail and damaging winds. 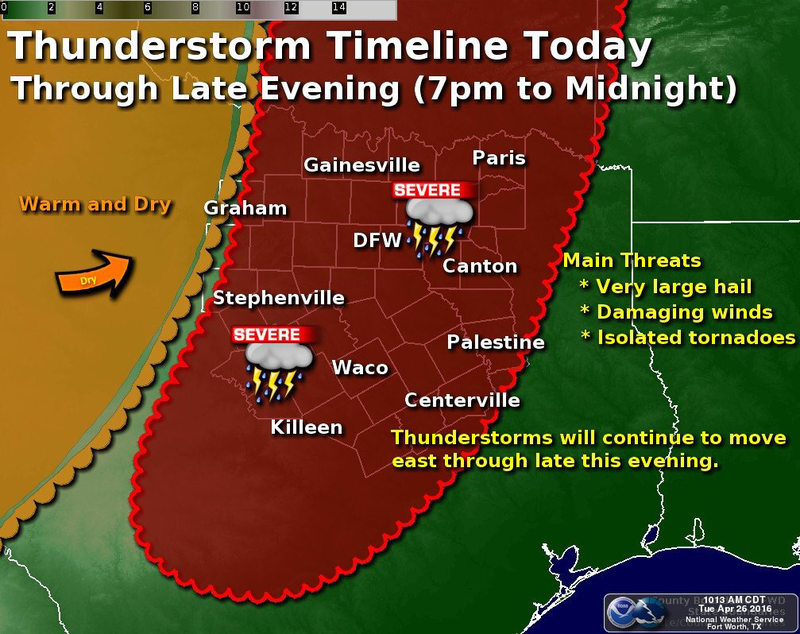 Courtesy NWS Fort Worth: The severe weather threat will start by late Tuesday afternoon, as a strong upper trough approaches from the west. This system will allow a dryline to set up well west of Interstate 35 Tuesday afternoon. Thunderstorms are expected to develop along and east of the dryline late Tuesday afternoon and move east through the late evening hours. 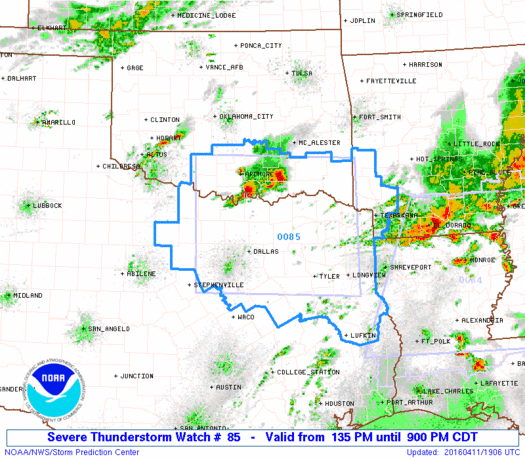 Storms that develop during this time are expected to be severe with large hail and damaging winds. 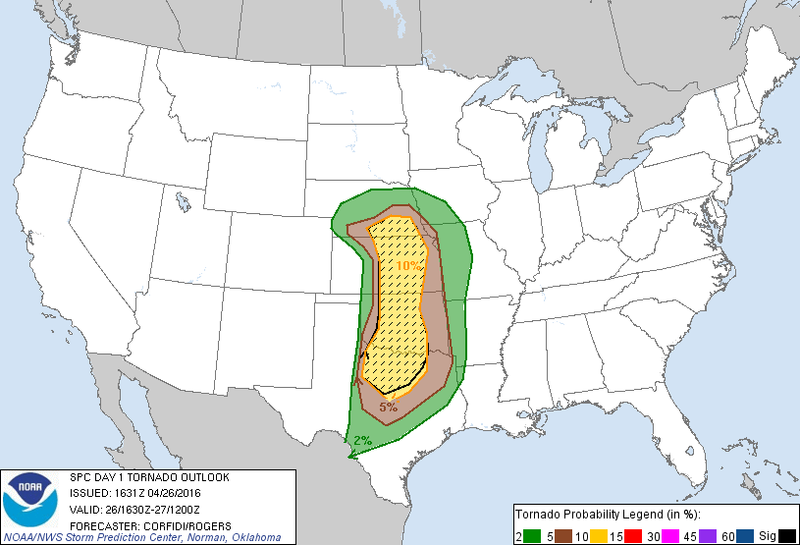 There is some threat for tornadoes but at this time it does not appear that conditions will be optimal for tornadoes. 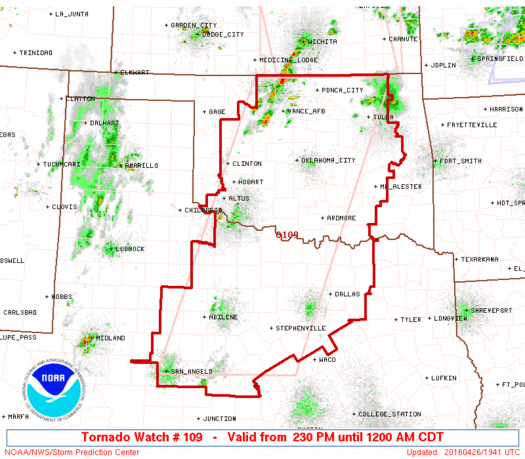 We will continue to monitor the tornado threat closely over the next 24-36 hours. Be sure to remain WEATHER AWARE tomorrow, as any storm that forms tomorrow may quickly become severe. There will be more updates throughout today and into tomorrow. Stay tuned for more information and the latest updates! Good afternoon everyone! This update will be the first of many over the next few days. 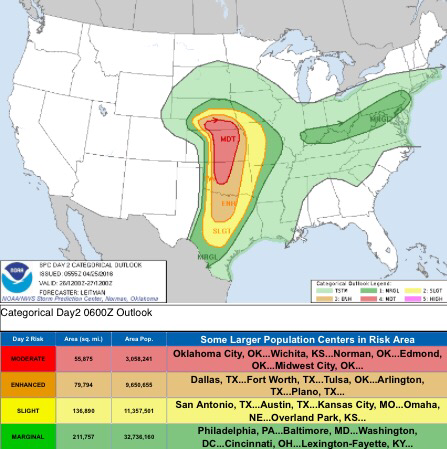 The NWS SPC has issued a 30% day 4 outlook risk for portions of North Texas, mainly along the Red River and across parts of far Northwest Texas. 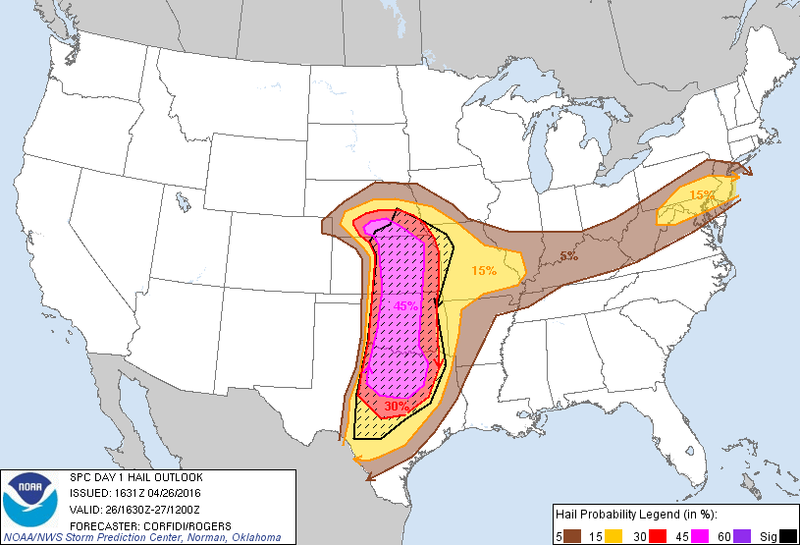 The rest of the most of North Texas, including DFW is under a 15% risk at this time. Although this is still multiple days out, the models have been consistent in agreance that we may see a severe weather unfold across the region Tuesday afternoon and evening. I am not trying to sound any alarms just yet, but this does have the potential at this time to be a possible outbreak. This is not set in stone, however, and COULD possibly change. ​ I am not trying to cause panic or sound any alarms just yet, but I encourage everyone to remain weather aware and pay close attention to updates and forecasts as we near the event. 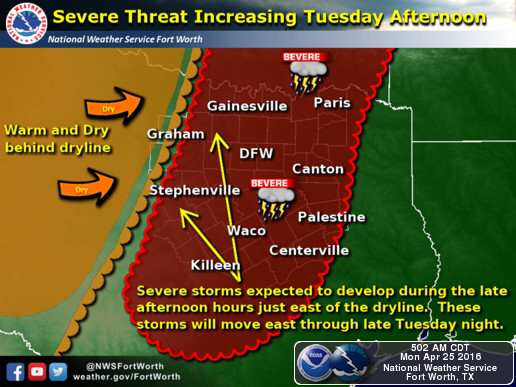 Courtesy NWS Fort Worth: As an upper level disturbance and dryline approach, showers and thunderstorms will develop along the dryline Tuesday afternoon. These storms will move into the western parts of North Texas Tuesday afternoon and into most of the rest of North and Central Texas Tuesday night. 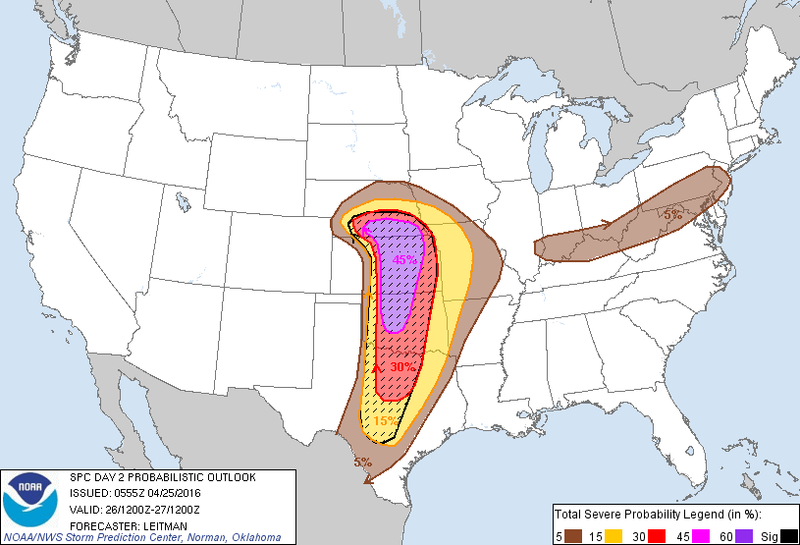 Damaging winds and large hail will be the main hazards. 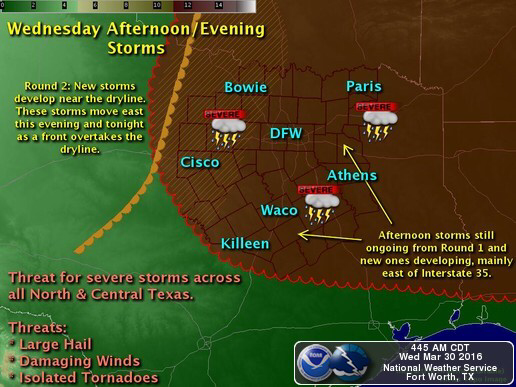 A few tornadoes will be possible especially west of I-35 Tuesday afternoon and evening. We will post more updates as they become available and as new data is available! 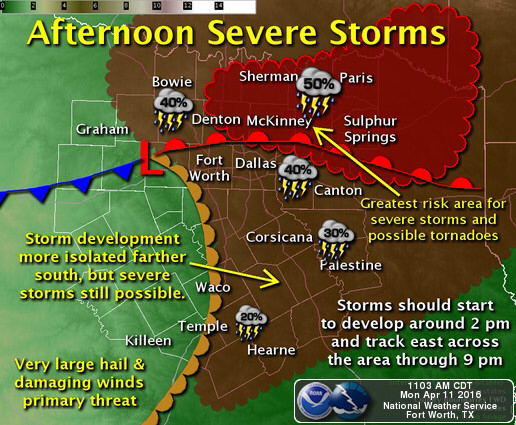 Storms are expected to develop across the North Texas region during the next couple of hours. Between now and 3 pm, most of the storms will form along a cold front that is moving southeast into the area. Other isolated storms are expected to develop ahead of a dry line where the cumulus clouds are growing taller into showers and eventually storms. All thunderstorms will have the potential to become severe and produce large hail and damaging winds today. An isolated tornado will be possible, especially near the warm front location. 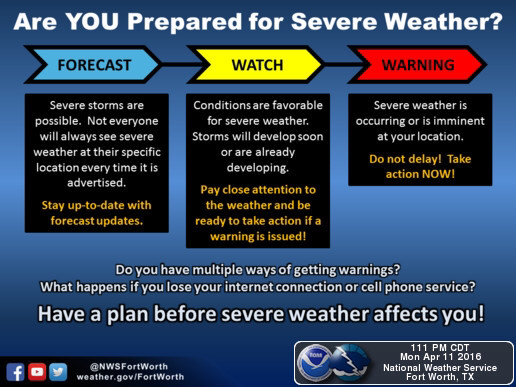 Are you prepared for severe weather? Here's a graphic that shows how YOU can become weather ready for severe storms expected this afternoon and evening! Don't be scared, just prepared! 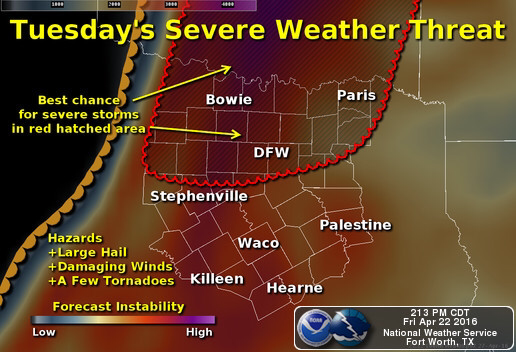 There will be a threat for strong/severe thunderstorms this afternoon/evening across North Texas. 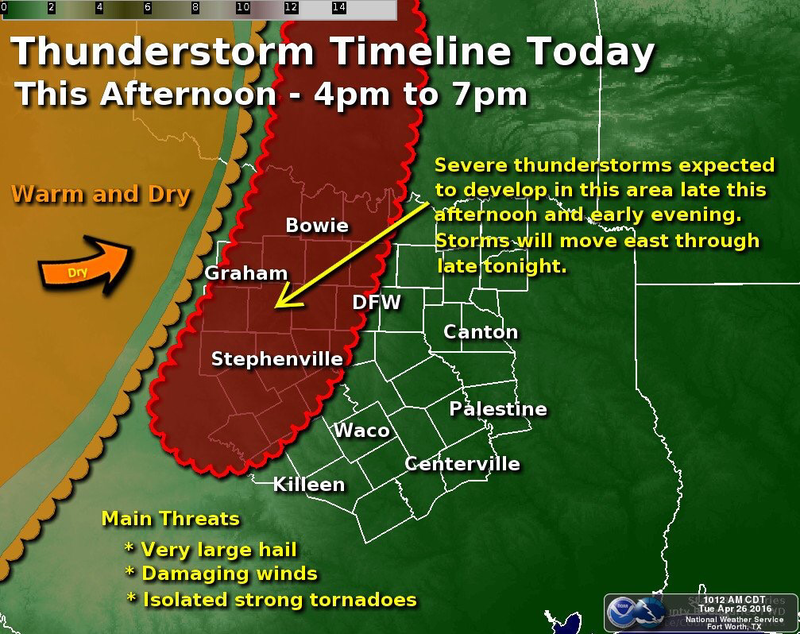 After this morning's round of storm clears out, the atmosphere is expected to destabilize East of the I-35 corridor and become favorable for the development of strong to severe thunderstorms this afternoon and evening. 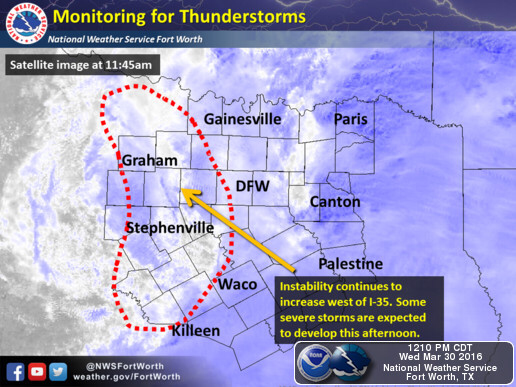 Additional thunderstorms are expected to develop along the dryline which will be located West of the I-35 corridor. Storms across North and Central Texas this afternoon and evening will likely be severe and will be capable of producing large hail, damaging winds and a few tornadoes possible. The threat for storms, possibly severe, will continue as a front overtakes our region and a dryline moves east across the region. 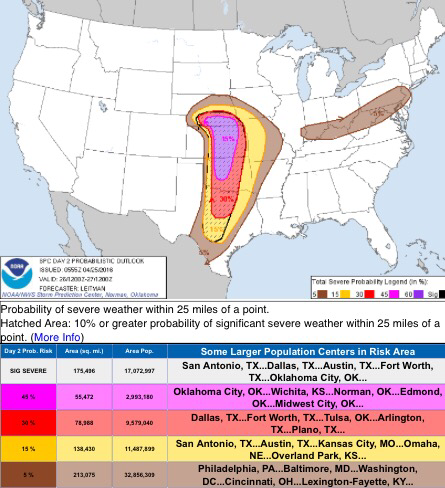 Courtesy NWS Fort Worth, Texas: As most of the morning shower and thunderstorm activity shifts east of Interstate 35 this afternoon, the atmosphere will destabilize during the peak heating hours of the afternoon across the rest of the forecast area. Additional thunderstorms are expected to develop along a dryline, which will be west of Interstate 35/35W. Some storms across all of North and Central Texas this afternoon and evening will be severe with large hail, damaging winds and a few tornadoes possible. The threat for storms, possibly severe, will continue tonight as a front overtakes the dryline moves east across the region. Courtesy NWS Fort Worth, Texas: Morning satellite imagery indicates a few breaks in the clouds west of Interstate 35. This is an area of increasing atmospheric instability. We are closely monitoring this area for thunderstorm development through midday. Stay tuned for the latest updates, information, watches and warnings. 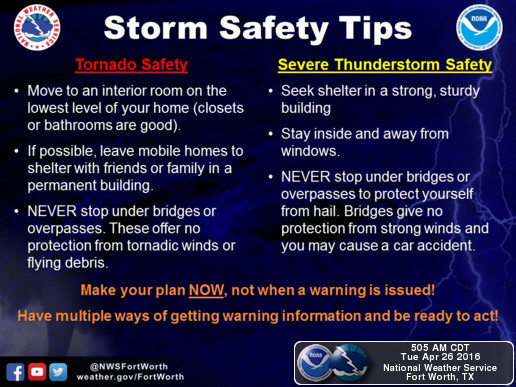 Stay weather aware today!